Psychopaths are an interesting breed, to say the least. They make up some of the most successful and influential people in the world, from CEOs to corporate lawyers. While many psychopaths benefit society in one way or another, you certainly wouldn’t be too happy around one, much less arguing with one. However, how can you tell? 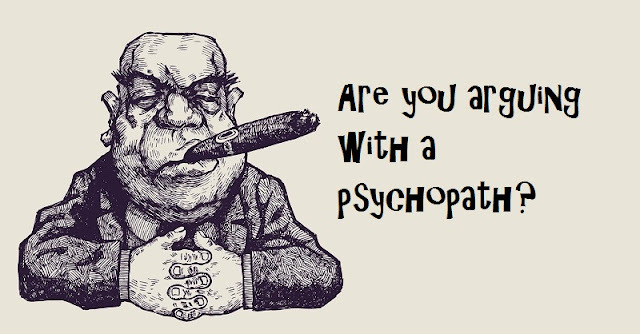 How can you know for a fact that you are arguing with a psychopath? Psychopathic people can have a hard time expressing empathy. One of the ways they might work around this is by adopting the hardships of others and painting themselves into a world of misfortune far out of the range of even their most miserable days. This can pop up in an argument with a psychopath when they attempt to make you feel guilty or sorry for them, despite them having the clear upper hand. Psychopaths can go from being happy to being in a deep rage almost at the drop of the hat – whatever puts them in the lead of an argument. This can also occur in someone with borderline personality disorder, which is believed by some to result in a similar lack of empathy. However, borderline personality disorder is completely different. This condescending behavior is one type of emotional abuse psychopaths unleash on those around them. When combined with their charm and often attractive personal traits, this puts the psychopath in a position where you might begin to feel bad about yourself, as they talk down to you. Related to the first point, psychopaths love to play the victim – even when they are the culprit. Steve Jobs – a presumed psychopath himself – notoriously denied that he had a premarital child, Lisa, in the early days of Apple. Just like that. He denied the birth of a human being and insisted the child was not his until years later. As a side note, psychopaths and sociopaths are easily confused. To find out the difference, check out the video below!